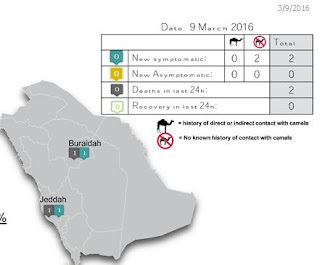 Buraidah's MERS outbreak rolls on with their 14th case - and 4th fatality - reported in a week. While several `primary' cases have been announced, many of the cases are the result of nosocomial transmission, including at least 2 HCWs and (as of today's report) 5 patients. Additionally, four cases were simply listed as `under investigation'. Today's report also includes a `primary' case from Jeddah, a 64 y.o. male who is already listed as having expired. We often see cases reported only after a patient is either in critical condition or has died. Since the MOH doesn't provide us with onset dates in their daily report, it is impossible to tell whether this indicates a delay in diagnosis, or a delay in reporting. 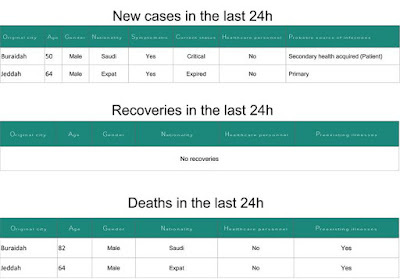 Hopefully this is data we'll be able to tease out of a future WHO MERS report.